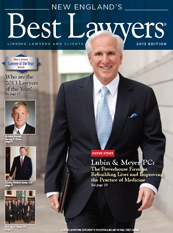 The publication New England's Best Lawyers®, July 12, 2013, featured Andrew C. Meyer, Jr. on the cover along with the article, The Powerhouse Firm on Rebuilding Lives and Improving the Practice of Medicine. "The systemic improvements the firm has forced over the years have been significant. In just one example, after a Lubin & Meyer suit uncovered a flaw in a major Boston hospital’s computer system that allowed medical professionals to overdose a patient resulting in her death, the hospital changed its protocols and put a backup system in place to safeguard against a similar tragedy." The publication lists the top lawyers in New England by practice area based on an extensive peer-review survey (more on the methodology). Lubin & Meyer has five attorneys listed in the areas of medical malpractice and personal injury litigation. They are: Meyer, Robert M. Higgins, Adam R. Satin, Krysia J. Syska, and William J. Thompson. Lubin & Meyer attorneys are licensed to practice in NH, MA, and RI.